I woke up late today and skipped breakfast. There were more meetings today and I also forego lunch until I got to the Atlanta Airport at 3pm. There were lots of choices at the airport. I would normally get something quick like a sandwich or pizza but decided this time to take the train two concourse away where there is a bigger food court with proper tables. I had the Spaghetti with Meatballs Combo which included a salad and a drink. 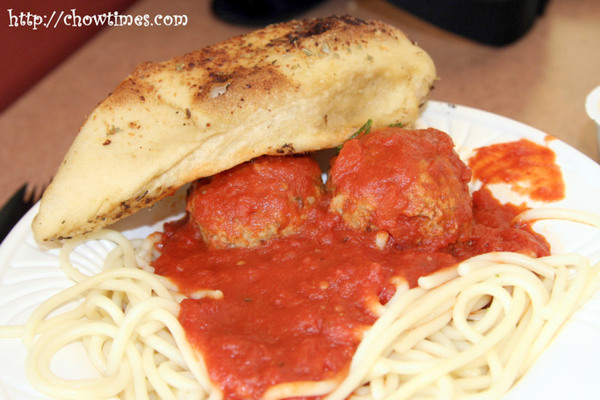 The spaghetti is nothing special but I like the big meatballs. That big piece you see down there is not chicken breast — but it sure does look like one, isn’t it? It’s a piece of bread — not sure what you call that type of bread. It reminded me of the Indian naan bread. The Combo included a salad and I chose Blue Cheese for dressing. 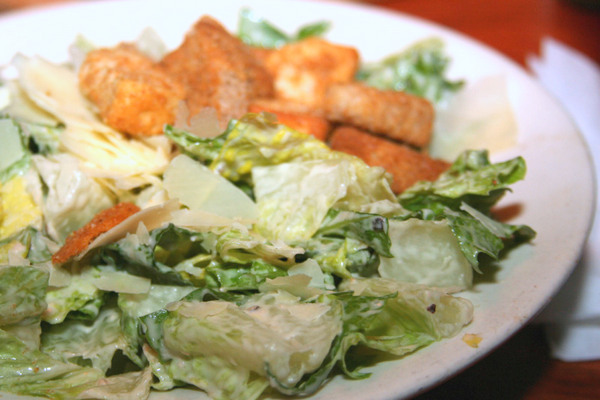 The salad does not look fresh at all. The costs is just above USD $10. Day 3 in Atlanta. Have been putting long hours going to one meeting to another. I really hate doing this because it does not give me time to plan for the meeting and not having a proper time to recap what the take-aways were. I figure that out tonight in the hotel. By 6:00 pm my mind was so saturated that I just don’t want to think about work anymore! Like Mark promised, he brought Paul and I to a Southern Cooking place. It was a really nice restaurant called South City Kitchen Vinings. The service was excellent — one of the places that stands out as genuine service, not waiters who fake it for a bigger tip. 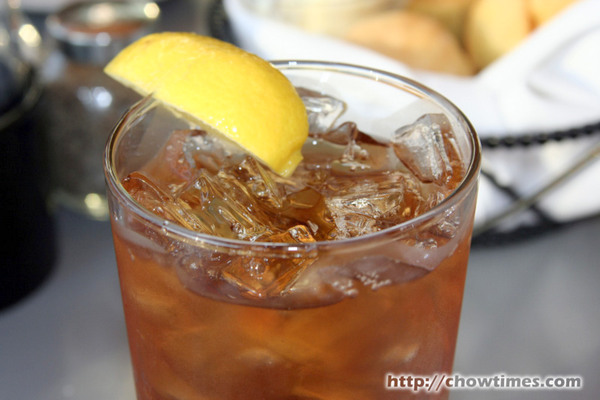 Thanks to Maritza who recommended that I order “sweet tea”, I chose this. It is basically iced tea and was pretty sweet. Free refills, that’s what I like. We were served muffins with butter. The muffins were soft and buttery. Just took only one coz I know the main dish will be large. Mark took me to a Mexican place for lunch today. I’ve never really been to an authentic Mexican restaurant before although there were a few around Vancouver. Not that I don’t like Mexican food but it’s just that I don’t know what to order besides Taco. The nachos and salsa were free. Mark told me that most Mexican restaurants will serve it free. 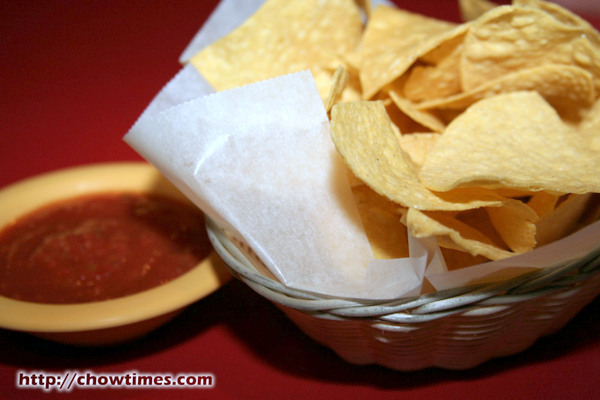 The salsa was made fresh and the nachos warm. Very nice — definitely much nicer than those we make at home. I really can’t remember what it is I ordered! 🙂 I know the short name — it’s the Lunch Special #6. Well, it has some rice. 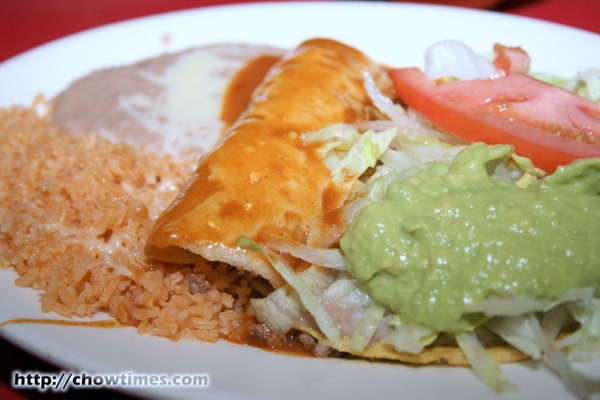 It also has some fried beans — all mashed up. Almost every dish has beans. Mexicans like beans but not me. There is also some guacamole (spelling correct?) — it’s the green stuff. Avocado, I believe. The lunch special was just $5.45. The restaurant is called The Border — kind of an odd name for Mexican restaurant, if you ask me, especially when these days the US is getting less tolerant of illegals from Mexico. Mark said he’ll show me Southern Cooking tomorrow. In my last night in Atlanta before I return to Vancouver, a few of my project team members finally told ourselves that we should just go out for a nice meal in a restaurants a block away from our hotel. Shahdad wanted Mexican while Rob fancies steak. I was the vote breaker … I chose steak. I heard so much about the Longhorn Steakhouse this entire week here and was told that there is a long line up most of the nights. So, we decided to give that place a try. We went at a right time because although there were five parties ahead of us, we were seated in just 10 minutes. Hmmm … good start. The Longhorn Steakhouse has a string of restaurants in the 24 east coast states from Maine to Florida. There are 14 Longhorns just around Atlanta itself. The interior is very western with longhorns, horse shoes, cowboy stuff and whatnots adorning the walls. The service was very prompt and very friendly. The night started with sourdough bread (or at least I think it is sourdough!) and butter. The bread was warm and felt like it’s just fresh out of the oven. 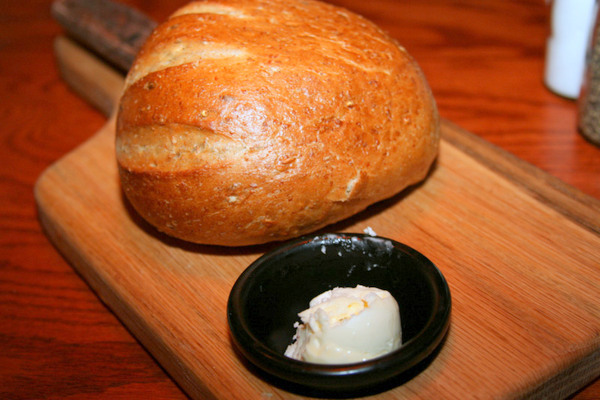 It was served on a wooden platter with a sunken cup for the butter. It was a great start. Next came the salad. Nothing fancy except that the plate was huge. 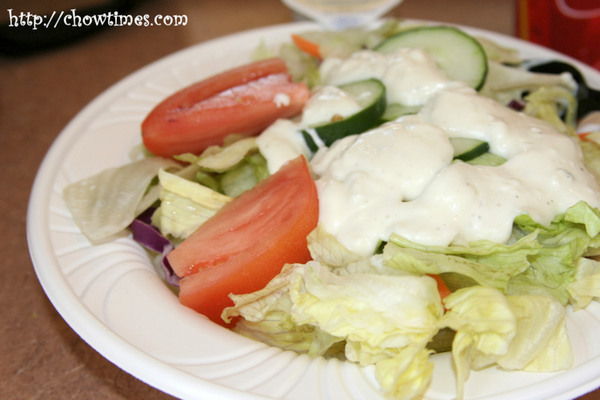 We agreed that this salad alone is good enough for dinner. I like this. I ordered the Flo’s Filet and Grilled Shrimp. The waitress recommended the Flo’s Filet saying it’s their most asked for selection. 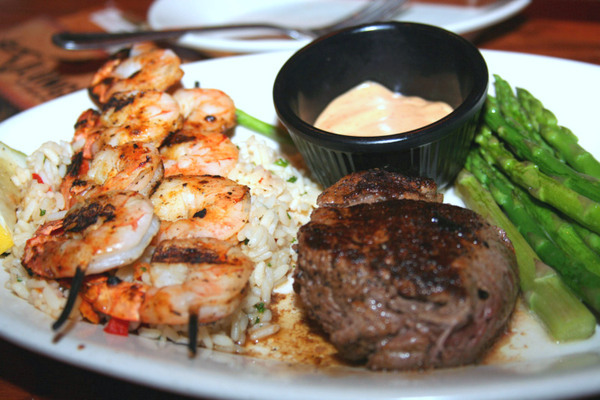 The Filet/Shrimp was served with rice and chipotle range sauce. That dish costs $20.49. I also order a side of Fresh Asparagus at $3.49. The prawns were really nice with the chipotle sauce. I took that and the asparagus first — yummy! The Flo filet is a 7oz fresh tenderloin cooked to medium rare. I did not touch the rice much because I was really full. Updated: 04 Feb 2015; This restaurant is closed. 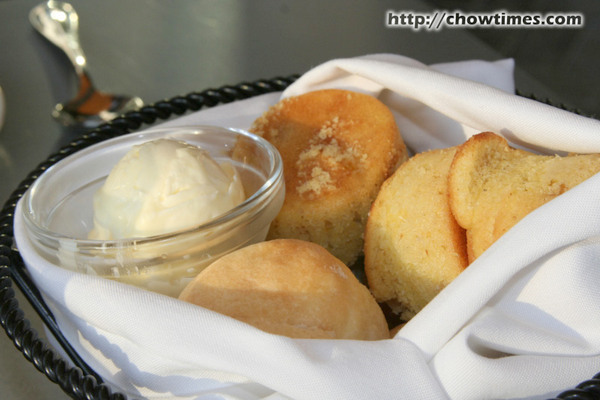 Sigh … been working in Atlanta the whole week and am seriously missing Suanne’s food! I sure look forward to coming home this weekend and have a simple bowl of noodle soup — nothing fancy, just plain noodle soup! There were so much I need to do here that I did not have much of a chance to have a good nice Atlantan meal. So, it’s pretty much food catered for the meetings and food at the mall. After another long day at the office, I just went over to the Cumberland Mall across the road to grab a quick bite from the food court. At the food court, there was this nice big banner with big delicious prawns that caught my attention. 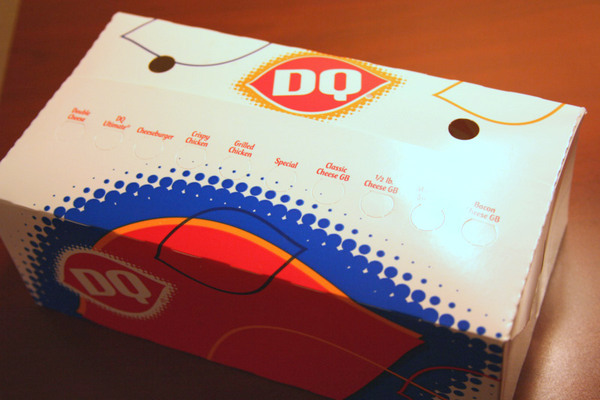 Sure, I thought, why not try the DQ’s Shrimp Basket. I expected it served in a basket, like the picture on the banner but as always, what you get is not exactly the same as what is advertised. 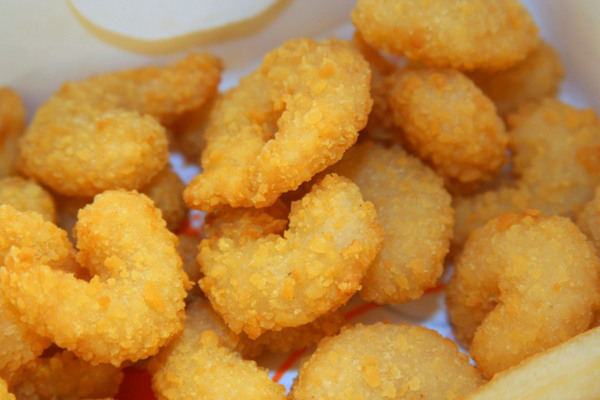 The Shrimp Basket should be called the Shrimp BOX. I am surprised by the size of the serving and the number of shrimps. They are deep fried and was served with fries. It looks very inviting, but does it taste good? Well … I find that North American shrimp is nothing much like those from SE Asia which tastes a bit more … shrimpy. 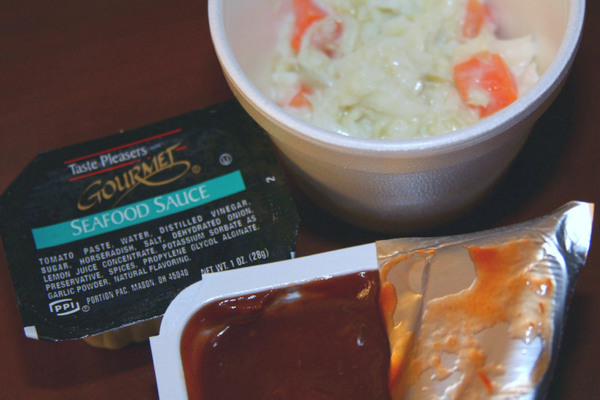 The shrimps also comes with a dipping sauce and a small bowl of coleslaw. The coleslaw was terrible. I threw it away. The meal costs less than US$5. Not a bad deal. However, it’s not something I’ll go looking for again. Just can’t wait to get home! On my flight to Atlanta, I thought I try out United Airlines’ Snack Box even though Suanne packed some snack for me. 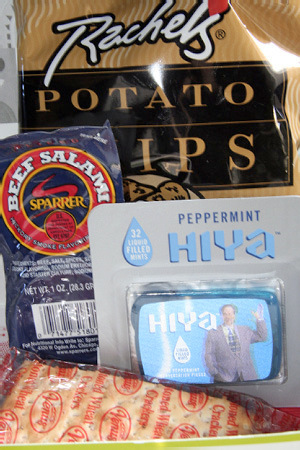 It has been a while since most airlines had discontinued free inflight meals even for long haul flights. 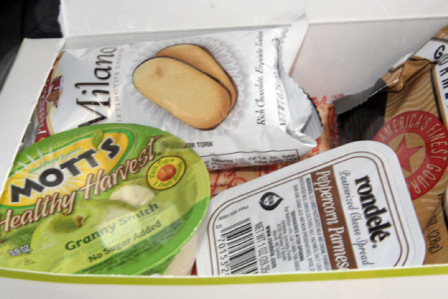 On United’s flight over 3.5 hrs, one could purchase United’s snack boxes for USD $5 each — they accept only cash. United has choice of four different types of snack boxes. Click here for their selection. I wanted something a bit salty and cheesey. 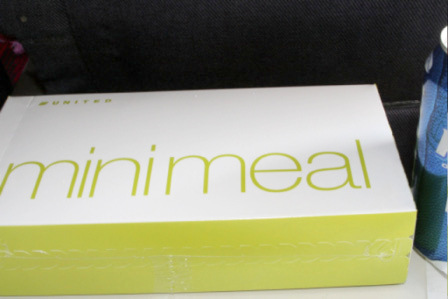 I opted for the Mini Meal Snack Box. The boxes were shrink wrapped. I was pretty surprised by the content. It was packed pretty tight and had a very good selection. The heart of a man may be compared to a sausage; no one can tell exactly what’s inside. I don’t know why no ketchup. 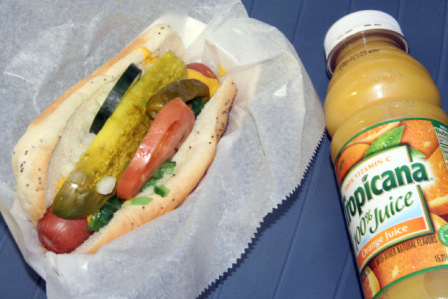 I find it strange because I have always wanted ketchup on hot dogs. It is a perfect meal with a little meat, vegetables, spicy peppers, cool tomato and a zing of celery salt. I also got myself a bottle of Tropicana Orange Juice. How much did it costs? 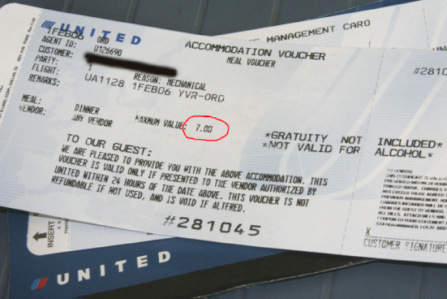 It’s slightly less than $7 (USD) including the drink — all paid for by United Airlines. Thanks a bunch for making me wait in the airport for four hours (NOT! ).